As the inventory of homes for sale continues at an all time high, sellers and real estate agents are getting creative to make their properties stand out. In our latest client submitted project, our friend Ed Rudock, an interior designer based out of Washington DC, shows how using WALLTAT wall decals can make your home just a little more memorable to potential buyers. 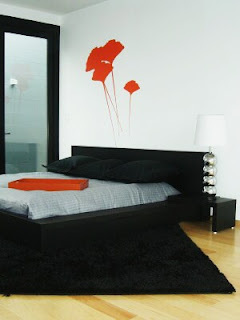 Ed used the Ginko Biloba in a size C in this bedroom to compliment the headboard of this contemprary bedroom. The end result is a high impact visual delight that brings color and style to a magnificently designed room- nice job Ed!